Business leaders in Manchester have reacted angrily to the decision to review plans to build super casinos as a way of regenerating deprived areas. The city was a surprise winner when it was chosen as the location of Britain's first Las Vegas-style super-casino. But Gordon Brown hinted to the House of Commons on Wednesday that he would now look at other routes to regeneration. 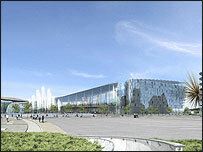 Chris Fletcher, of Greater Manchester Chamber of Commerce, said there had been a lot of time and money wasted. He said: "I think following the announcement today we are amazed and a bit shocked about what Mr Brown has said. "Manchester won fair and square. "It also brings into question how much time and money has it all cost? There has been an awful lot of time and money wasted," he added. "We are waiting with bated breath to see what these other proposals might be. "These areas are desperately in need of significant investment to kick-start crucial regeneration work. "If we are hearing it's not going to happen, what has Mr Brown got to replace it to make sure these people have access to jobs?" 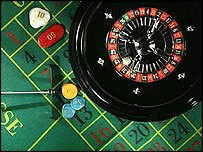 The Prime Minister told the Commons on Wednesday that regeneration may be a better way of meeting the economic and social needs of hard-pressed areas than the creation of supercasinos. He said it was an issue that would be "reflected on" over the summer and that a full report on gambling in this country would be published in September. Manchester Blackley Labour MP Graham Stringer said he was surprised by the decision. "The idea that Manchester City Council haven't thought of all the possible ways to regenerate east Manchester is, quite frankly, insulting," he said. "To regenerate areas you have to bid for investment or the government has to put investment in." Council leader Sir Richard Leese said there was "no need for panic". "We will continue to push for a destination casino in east Manchester which we believe will deliver the maximum regeneration benefits for the area," he said. "We intend to have further discussions with the government and will not comment further until those have taken place."